One Day We Should are a young family who sold everything they owned to travel around the country and since 2017 they have been living on the road and living the dream. We supplied them with some products before their departure and recently checked in to see how they are fairing. We have driven more than 75,000kms! My wife Kirby and three young kids Axl, Darci and our youngest Bonnie (or more often referred to as Bonbon) hit the road in our trusty ute with our caravan in tow and haven't looked back since. We love to get off the grid and explore some of the most remote places in Australia. During our first "Lap" of Australia towing a 3-tonne caravan, we found a full-size caravan seriously limited our ability to get to the real off-road destinations. After looking into all the touring setups available we decided our best option would be building a fully self-contained vehicle, giving us the ability to unhook the van and head off just with our ute. We sat down and made a list of all the features such a vehicle would need: safe and comfortable on road, heaps of payload, and enough 'off-road credentials' to take us anywhere we want off the beaten track. I think we have achieved just that. Building one of Australia's best off-road touring utes. We started with a stock standard 2018 Mazda BT-50 and we had it converted to a true six-wheel drive with help from the guys at 6x6 Australia. We set the ute up with everything our family needs for remote touring, 215 litres of diesel, 200 litres of water, fridge, a massive rooftop tent, plenty of lighting (not only in the canopies but also campsite floodlights), pumps and a purpose-built charging bay for all our electronics such as cameras, phones drones and the laptop. We also carry a bunch of 18V tools that get a workout not only around the campsite but also when Gibbo picks up work along the way. Kirby's favourite addition seems to be the 2000W Pure Sine Wave Inverter we have that runs her hair straightener or hair drier with ease! As you can tell we are fairly heavy users of electricity, so we needed a 12V system capable of keeping up with our needs. We ruled out carrying a generator due to being conscious of our payload, the need to carry volatile fuel and being noise considerate campers. There really is nothing worse than setting up camp in a beautiful remote location, pulling a couple of cold ones out of the fridge, settling in and then somebody starts up the dreaded generator! Instead, we decided to keep our setup simple yet 100% silent with next to no maintenance. How? A big battery, yep we have a huge 230Ah deep cycle battery mounted in an enclosure under our tray. To keep this massive battery charged we went with REDARC’s new 50A in-vehicle DC to DC charger; the BCDC1250D. This charger is a simple set and forget unit. It charges from the car's alternator while we are driving but more importantly it has an inbuilt MPPT Solar Regulator! That means we could mount the biggest solar panel we could physically fit (200W) permanently on top of our rooftop tent. This works well most of the time but when we have the rooftop camper set up this panel often finds itself in the shade, so for these times (or occasionally when we just need more power) we also carry a REDARC 160W monocrystalline portable solar panel. The added benefit of the portable panel is the ability to set it up in direct sunlight at the proper angle. *A little tip to check you have the panel set up in the best way to catch as much solar energy as possible, is to adjust it till the shadow cast by the panel is the same size and shape as the panel itself! We often find we get far more input from the properly setup portable panel than the much larger fixed panel. The other big benefit of REDARC’s BCDC1250D is the fact that it has inbuilt charging profiles for all major battery types. This means if we ever decide to swap out our massive battery to lithium we won’t have to buy any new charging equipment! So how have we found it so far? 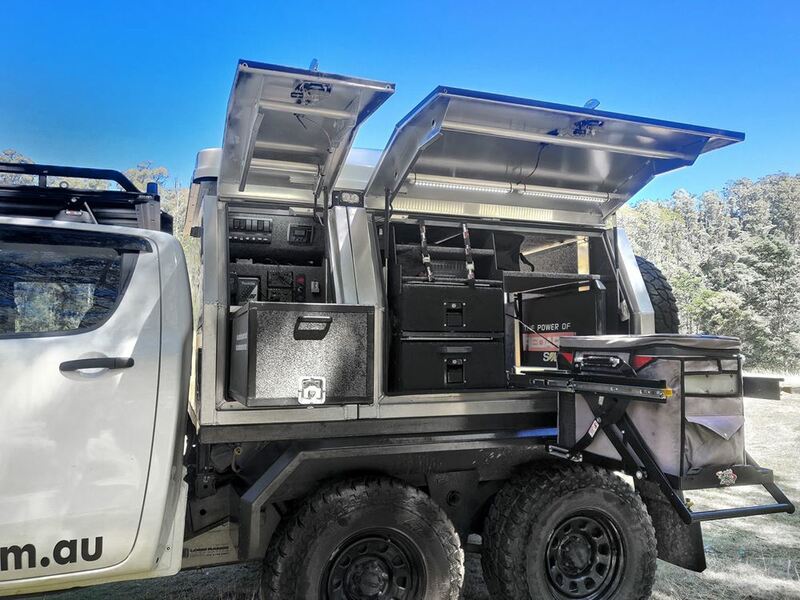 Since finishing the ute build, we have never plugged into any other power source, never paid for a powered site and we have also never run out of power. Considering we live full time on the road I think this speaks for itself.